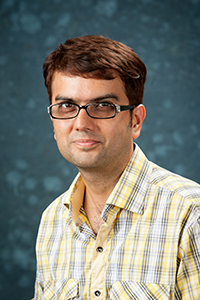 Sidharth's research interests lie at the intersection of information theory, algorithms, and networking. He is currently particularly interested in the field of network coding http://www.ifp.uiuc.edu/~koetter/NWC/index.html which neatly merges practice and theory in all three of these fields. However, his interests are eclectic (above all, he likes a good challenge) and he has dabbled in communication complexity, quantum computation, coding theory, random matrix theory, and signal. S. Jaggi, M. Langberg, “Network Security” in Network coding: fundamentals and applications, Elsevier Inc., 2011 PDF of chapter, book. C. L. Chan, S. Jaggi, V. Saligrama, and S. Agnihotri, "Non-adaptive Group Testing: Explicit bounds and novel algorithms", accepted for publication in the IEEE Transactions on Information Theory. Y. Li, H. Yao, M. Chen, S. Jaggi, A. Rosen, “RIPPLE Authentication for Network Coding,”accepted for publication in the IEEE Transactions on Networking. B. K. Dey, S. Jaggi, M. Langberg, “Codes against Online Adversaries, part I: Large Alphabets,”accepted for publication in the IEEE Transactions on Information Theory. B. K. Dey, S. Jaggi, M. Langberg and A. D. Sarwate, "Upper Bounds on the Capacity of Binary Channels with Causal Adversaries", accepted for publication in the IEEE Transactions on Information Theory, Feb. 2012. A.-H. Mohsenian-Rad, J. Huang, V.W.S. Wong, S. Jaggi, R. Schober, “Inter-Session Network Coding with Strategic Users: A Game-Theoretic Analysis of the Butterfly Network,” accepted for publication in the IEEE Transactions on Communications. A. A. Gohari, S. Yang, S. Jaggi, “Beyond the Cut-Set Bound: Uncertainty Computations in Network Coding with Correlated Sources”, accepted for publication in the IEEE Transactions on Information Theory. H. Yao, S. Jaggi, M. Chen, “Passive Network Tomography for Erroneous Networks: A Network Coding Approach,” IEEE Transactions on Information Theory, vol 58, no. 9, 5922-5940. Sept 2012. T. K. Dikaliotis, T. Ho, S. Jaggi, S. Vyetrenko, H. Yao, M. Effros, J. Kliewer, E. Erez, “Multiple-access Network Information-ﬂow and Correction Codes,” IEEE Transactions on Information Theory, Special Issue: Facets of Coding Theory: from Algorithms to Networks (in honour of Ralf Koetter), vol 57, no. 2, 1067-1079, Feb. 2011.